Pizza Peppers are great for adrenal nourishment, supplying many of the key nutrients to help the adrenal glands function. The peppers are chock full of vitamin C needed by the adrenal cortex to make cortisol. The olives and olive oil contain monounsaturated fats, which are the building blocks needed to make their hormones. Lastly, the garlic, thyme, rosemary and oregano help to reduce inflammation in the body, which helps to relieve nasty inflammation. Furthermore, this dynamic combo significantly relieves the adrenals from overload! Drain meat mixture and add to a large bowl along with tomato sauce, tomato paste, crushed red peppers, herbs, salt and pepper. Stir until well combined. 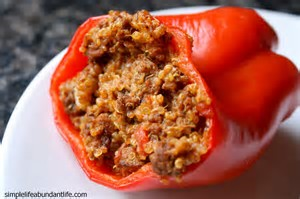 Scoop the filling evenly into each of the four bell peppers. Place peppers standing up into a small glass baking dish. Bake for 40-45 minutes, until peppers are tender and filling is heated through.